Can you believe it's already time for another Polish Con?! 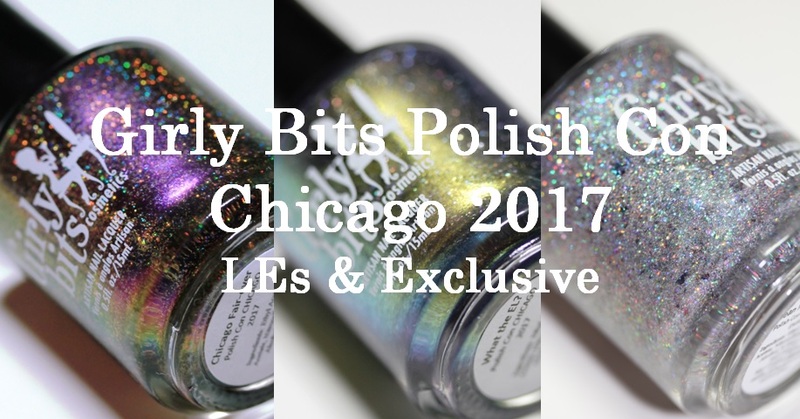 Time seems to fly and with the flying time comes some GORGEOUS polishes made just for Polish Con Chicago 2017 from none other than Girly Bits! The three polishes in this post will be available at Polish Con Chicago for $13 USD each, tax included. Chicago Fair-ever? and What the EL? will be available to purchase for a limited time on the Girly Bits website for $16.50 CAD and also available to stockists. I have a ton of photos of three very special, extra beautiful polishes so let's get into it. Bean Me Up Scotty is a mixture of several types of holo pigment, teal to purple to fuchsia multichrome flakes, and a hint of teal shimmer. It was inspired by the Cloud Gate Sculpture, also known as the "bean.” Girly Bits Bean Me Up Scotty is the event exclusive and will only be available in person at the event. There is no limit on the number each person can purchase. If Girly Bits sells out at the event, they will take orders at the event and ship them when they return to GB HQ. I am wearing 3 thin coats plus a thick coat of top coat in these photos. Girly Bits Bean Me Up Scotty applies very smoothly and easily considering it's so jam packed with glitters and flakies. It's a very fluid formula and I show it below as a topper though it can easily build up to opacity on its own. Removal takes a bit more effort than your average creme but it's not bad at all for a glitter/flakie like this! I wanted to show Girly Bits Bean Me Up Scotty layered as a topper over various base colours. I actually really love this as a topper too! So versatile. In my photos I am wearing two easy, fluid coats. Girly Bits What the EL? practically applies itself. I was shocked (even though I shouldn't be because Girly Bits polishes always blow me away) by how easily this went on the nail. It's an incredible formula and absolutely breathtaking. The little flakies dry very flat and it's incredibly smooth even without top coat though I am wearing top coat. Removal is very easy. Girly Bits Chicago Fair-ever? is a multichrome that reflects purple, blue, fuchsia, and gold, and is filled with gold holo microglitters. This is one of two event limited editions. There is no limit on the number each person can purchase. If we sell out, I will take orders at the event and ship them when we return home. I am wearing three coats plus top coat in my photos. This builds up really nicely in two coats but I used a third to get some extra depth but the formula is very easy and dries quickly between coats. I did need a thick layer of top coat to smooth out the microglitters but it does dry quite smooth. Removal is pretty easy - just a little bit of effort is needed to get the microglitters off. And this baby is a chameleon! Wow! Girly Bits will also have a very limited quantity of Pier-less Beauty (the road to polish con LE) and V.I.Polish Chicago 2017 (V.I.P bag polish) available at the Girly Bits table at polish con. Due to the extremely limited number of bottles available, the Girly Bits team will put half of the stock out on the table at VIP entrance, then the remaining stock out at general admission time. Launch of the two Limited Editions on the Girly Bits website will be Sept 24, 2017.